Ever thought a hatbox didn’t do justice to your collection of hats? 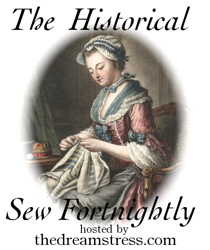 Ever wanted to display your hat-making skills to the world, or at least to your visitors? Why not try making a hatstand! 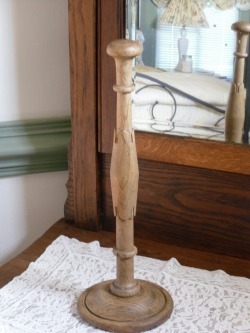 A turned Victorian hat stand, with carving details on stem. 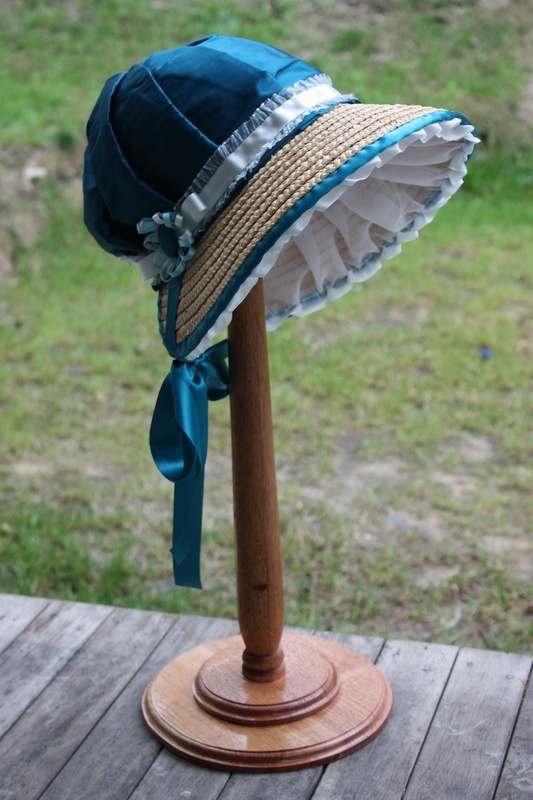 After seeing some hatstands at a friend’s house, I have been keen to make a pair to display my Regency bonnets. Having my bonnets on display means that I could spend time admiring and enjoying my handiwork as a decoration, rather than always having them packed away awaiting my next costuming event. Hatstands, both as larger hall furniture and as smaller dressing table pieces, became popular during the Victorian era. They could be made from wood or cast iron, and could be covered with a fabric, such as velvet. They were also often weighted in the base, which increased the stability of the stand once a hat was placed on the top. 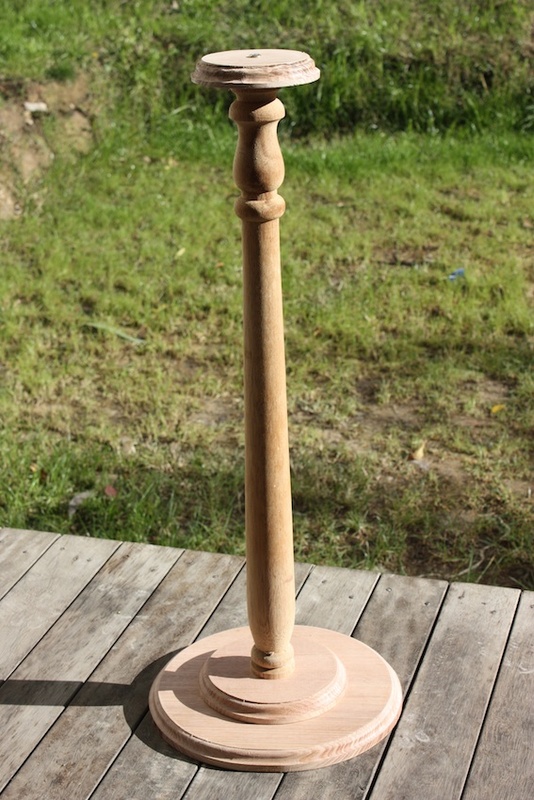 This week I have been busy making a reproduction of a Victorian hatstand that could have been used on a dressing table. I need to give full credit to my husband because – in the end – it was he who did most of the woodwork. 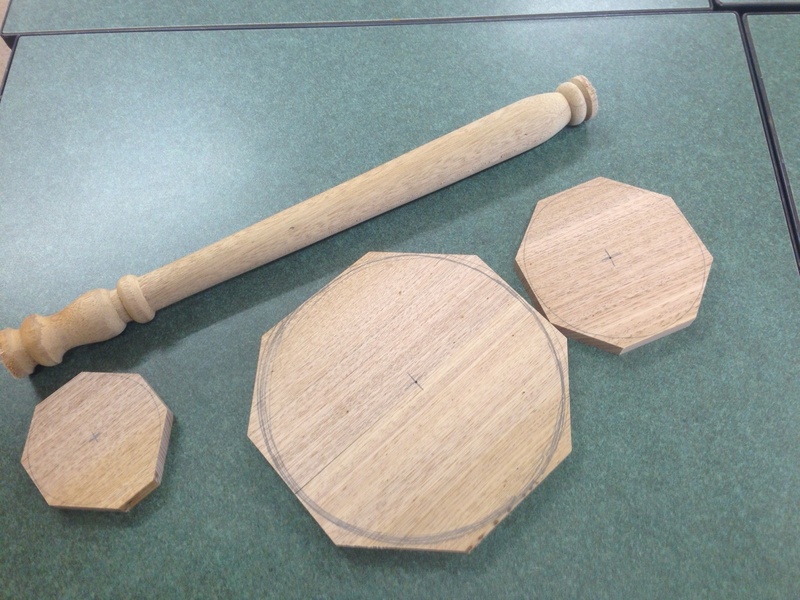 Step 1 – Turning the pieces: You can turn your pieces on a lathe if you have access to one. I didn’t, so for the central pole I used some turned wooden balustrades leftover from some renovations. For the base and top I used two pieces of wood cut into a circle (with a jigsaw), with the edges decoratively routed (with a router). My pieces, semi-prepared for assembly. I ended up adding an extra piece for the base to increase stability. Step 2 – Sanding: Sand any rough edges smooth. If you have turned your pieces on a lathe, this can be more easily done on the lathe after you have finished shaping your pieces. If you have used a router (like I did), pay particular attention any rough edges left by this machine. Remember to always sand with the timber’s grain line! Step 3 – Attaching the pieces: I used long screws to attach the bottom and top pieces to the stem. You could also use dowelling joints or strong glue (make sure the glue is very strong if that is all you are using). You could even rebate the turned pole into the base and the top for extra strength in the joints. Step 4 – Finishing off: Apply paint, stain or lacquer – depending on your tastes. If you have managed to scrounge together offcuts of different types of wood for your pieces, a coat of paint might help bring uniformity to the finished piece. If you have used a light coloured timber, a stain could make it look more like the oak pieces used in the Victorian times. 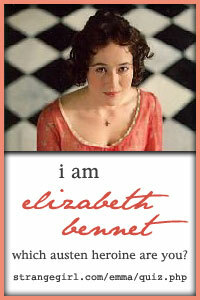 I managed (by fluke!) to somehow semi-match my offcuts of wood to my balustrade, so I was happy to just lacquer my hatstand. Finished! A lovely display and a relatively easy project to complete. For extra weight in the base, put a second turned disc on top of the base disc (as I did). You could also inset a piece of steel into the base if you are using particularly lightweight timber (such as pine). Using a heavier hardwood and reducing the height of the stand may be enough to reduce any instability without needing an additional weight in the base. Use secondhand timber on a lathe to create a rustic look. Redgum hardwood timber would look fantastic with its intricate grain variations. If you don’t have access to a lathe, use a thick dowel rod or trim down an old turned balustrade or table leg. Some hardware stores may even sell pre-turned discs that might be suitable for the base. Transform an old turned wooden lampshade into a hatstand – just take off all the electrical wiring and glue a wooden doorknob onto the top.